GIBSON introduced the L-CENTURY (CENTURY OF PROGRESS) model in 1933. The model was named after the Century of Progress International Exposition World's Fair held in Chicago to celebrate the city's centennial. Gibson unveiled this model at the Chicago World's Fair. 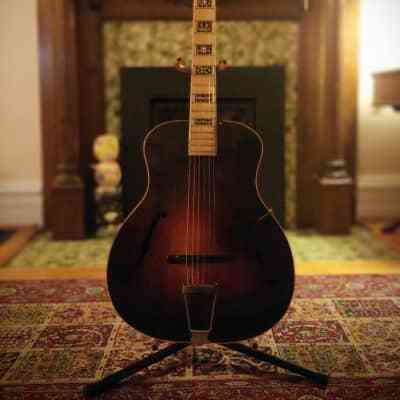 Gibson had been making L-series flat top acoustics since 1926 and already had a range of models by this time. For this Century of Progress Model, however, Gibson decided to showcase the use of plastics like pearloid and celluloid, which covered the fingerboard and headstock and were also used for the bindings, tuner buttons, pickguard, and bridge pins. The Gibson L-Century is one of the few guitars with rosewood inlays on a pearloid fingerboard - its usually the other way around! Gibson also used eye catching figured maple for the back and sides (instead of the standard mahogany). Otherwise the Gibson L-Century has the same dimensions as the standard L-Series models. "Wood: Figured curly maple back and rim; mahogany neck; spruce top. Fittings: Rosewood bridge with offset bone saddle and white pins; inlaid brown celluloid finger-rest; nicker plated individual machine heads; white end pin. Body size: 14.75" wide and 19.25" long." Take the GIBSON L-CENTURY (CENTURY OF PROGRESS) price survey. 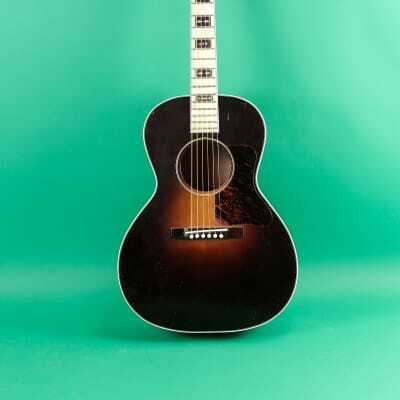 Buy GIBSON L-CENTURY (CENTURY OF PROGRESS) acoustic guitars.